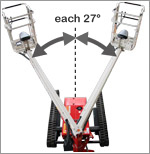 Traveling range (when the boom is horizontal) is 2.61m. You can open the engine cover without tools. 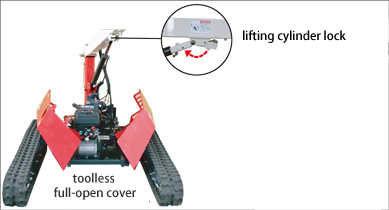 "Lifting cylinder lock" helps you to overhaul and maintenance the machine safely. 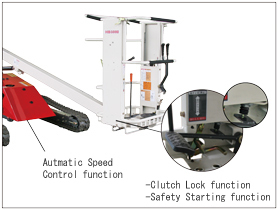 PLATFORM Maximum loading capacity 100kg/ 220.5lbs. DIMENSION Total length 3180mm/ 125.2in. 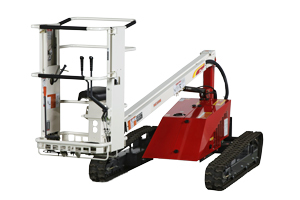 *1 This distance is of the center of the work-platform when the boom is horizontal. *2 The maximum angle of inclination for use is 5 degrees.